The West Bengal Joint Entrance Examinations Board (WBJEEB) was constituted in the year 1962 by the Government of West Bengal for the purpose of conducting Joint Entrance Examination for admission to various institutions in West Bengal imparting education in medical, engineering and technological courses. WBJEEB conducts Common Entrance Examinations for various professional Undergraduate and Postgraduate level courses in the State through effective state-of-the-art technology.The qualifying candidates of WBJEE gets admission in universities, government colleges, self-financed engineering and technological institutes, it always endeavors to advocate transparency and implement effective state-of-the-art technology in conducting such examinations. WBJEE is held in various districts of West Bengal and in Assam and Tripura every year. 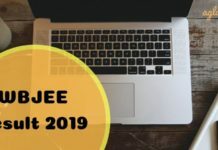 Candidates may check all the important dates for West Bengal JEE from the table below. Private & Self Financing Engineering & Technology Colleges. Broadly speaking, the West Bengal Joint Entrance Examination syllabus is based upon PCM topics taught in classes 11th and 12th. Even so, WBJEEB specifies complete WBJEE syllabus so as to make things easier for aspirants. Candidates can check WBJEE syllabus from here or information brochure (which is yet to be released). Since the syllabus is crucial and vast, it has been talked about separately. Question paper of WBJEE will be separate for Mathematics, Physics and Chemistry. Since WBJEE is a offline pen-and-paper based exam, students can take home the WBJEE question paper after exam. This is helpful for them as they can use question paper and answer key to check exam performance even before the board declares result. 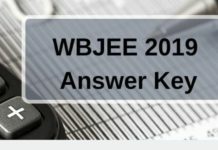 Question paper of WBJEE is also useful for students who will appear for WBJEE exam again as a previous year question paper which they can use to prepare for exam. For students who are appearing for the exam, it is advisable to go through last year’s exam question paper and practice.